No Christmas or Hanukkah dinner is complete without bread or rolls, and this delicious Buttermilk Biscuit Recipe is the perfect addition to any holiday meal. While the typical roll or buttermilk biscuit has tons of extra fat and calories, each of these tasty biscuits has just 3 Points and they are soft, doughy and delicious…..sooooo good!! They taste so great, that no one will even know the biscuits are low in calories or Points. And it’s such a fast dish to prepare, it’s the perfect biscuit to make any time of the year, with any dinner. So if you are looking for a good Christmas Biscuit Recipe, or a good Hanukkah Bread Recipe, give this one a try. It’s a great way to enjoy some yummy carbs, without busting your Weight Watchers Points bank! ** If you can find a fat free buttermilk to use instead of the skim milk, do that…it adds a nicer flavor to the biscuits. Preheat oven to 375 degrees and spray a 6 cup muffin tin with cooking spray. Stir ingredients together and divide evenly between 6 muffin cups. Bake for 12 minutes or until golden brown. This may be a silly question, but would plain ‘ol unsweetened original Almond Milk work? I haven’t ever tried it with that substitution, but I don’t see why it wouldn’t work. The texture may be a tad bit different, but I think the taste would be pretty similar. Ut oh, I accidentally bought reduced fat butter milk… Any tips on figuring out the points? So excited to try these tonight. It most likely will not increase the Points + value at all. At the most, it will increase by 1. Just add the additional fat grams into the amount listed in the recipe’s nutritional data, and then enter it into your Weight Watchers Points Plus calculator. I realize this is an old post, but I am happy to have found it! 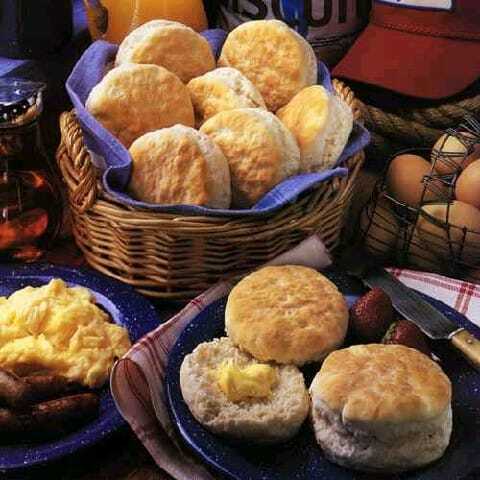 It sounds like a drop biscuit, more or less (no rolling and cutting), but the photo looks rolled and cut. Do the tops really smooth out that much just baking in the tins? Thanks! That should work. Give it a shot and let us know how it turns out! could u use fat free half n half instead of the buttermilk or skim milk? You definitely can! But the buttermilk just adds such a nice flavor to the biscuit. These were fantastic! They taste just like the full fat variety and they were super easy to make. My whole family gobbled these up so fast I had to hide one so I could have a snack later!